LG and GE make the best washer-dryer combos and laundry centers, respectively, with performance and features that are praised by owners. If you have a smaller budget, or a smaller space, look to Magic Chef and Whirlpool; both are top performers that will fit in tight squeezes without squeezing your wallet. Specs that Matter Wash/dry cycles - 9/4 Capacity - 2.3 cu. ft. Size (w,d,h) - 24" x 25.25" x 33.5"
The 2.3 cubic foot LG WM3488HW gets the best reviews of any other washer/dryer combo we evaluated. Compared to similar models, it's reported as efficient, a good performer, and it fits in small spaces where outside venting is not available. Features include a sanitizing option for things you want clean -- but don't want to wash. 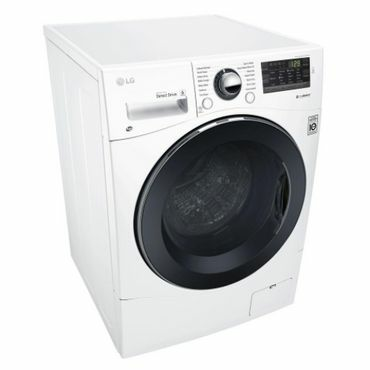 In addition to white, this washer/dryer combo comes in silver as the LG WM3488HS (Est. 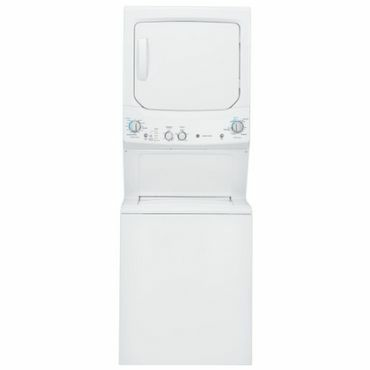 $1,700) [http://www.homedepot.com/p/LG-Electronics-2-3-cu-ft-High-Efficiency-All-in-One-Front-Load-Washer-and-Electric-Ventless-Dryer-in-Silver-ENERGY-STAR-WM3488HS/207024917]. Specs that Matter Wash/dry cycles - 7/1 Capacity - 2.0 cu. ft. Size (w,d,h) - 23.4" x 23.1" x 33.4"
If you want to save yourself trips to the coin-op laundry, but don't have the budget for a $1,000-plus ventless unit, reviewers say the Magic Chef MCSCWD20W is a great choice. Owners say it works well if you're careful not to overload it, and it's reported as quiet during operation. While there's only one drying cycle, it has a good number of wash cycles, including a customizable My Cycle and a popular sanitize cycle. This model is white, but it's available in black as the Magic Chef MCSCWD20B3 (Est. $850) [https://www.homedepot.com/p/Magic-Chef-2-0-cu-ft-All-in-One-Washer-and-Ventless-Electric-Dryer-in-Black-MCSCWD20B3/301799902]. Specs that Matter Wash/dry cycles - 11/4 Wash/dry capacity - 3.2/5.9 cu. ft. Size (w,d,h) - 26.8" x 30.85" x 75.5"
If you have the space for a 27-inch wide laundry center, then the GE GUD27ESSJWW ranks among the best choices. Though small compared to individual washers and dryers, the 3.2 cubic foot washer and 5.9 cubic foot dryer provide enough capacity to wash and dry the typical laundry loads produced by a small family, users say. The GUD27ESSJWW is reported as very straightforward and simple to use, and many owners say they were happy to find a top-loading option. A gas version, the GE GUD27GSSJWW (Est. 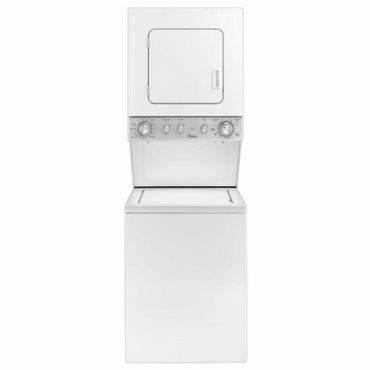 $1,400) [http://www.homedepot.com/p/GE-Spacemaker-Washer-and-Gas-Dryer-in-White-GUD27GSSJWW/205908380] is also available. Specs that Matter Wash/dry cycles - 5/3 Wash/dry capacity - 1.5/3.4 cu. ft. Size (w,d,h) - 23.88" x 26.88" x 70.75"
If you're very short on space, the 24-inch-wide Whirlpool WET4024EW is a laundry center worth considering. The top-loading washer has a capacity of 1.5 cubic feet, the dryer is 3.4 cubic feet, and reviewers say that's sufficient for a couple and that it can handle more laundry than you'd expect. The WET4024EW fits nicely in a closet, and cleans and dries well, reviewers say. While it's a basic machine, that's what many owners were looking for. These are true "combo" units because they wash and dry clothes in the same appliance. Washer-dryer combos don't need to be vented to the outside because they have condenser dryers (which make them convenient for those without a place for a dryer vent). Instead of using hot air to dry laundry like a typical dryer, a condenser dries laundry by continually condensing the water vapor in the laundry into water and then pumping the water out through a drain. It's a slow process though, a full cycle can take up to five hours. Washer-dryer combos are very compact, often measuring only 24 to 27 inches wide and 33 to 35 inches tall. This type of all-in-one unit combines a stacked washer and dryer. Laundry centers are more compact than full-size washers and dryers, and they are available in 24- or 27-inch widths. They are shorter than many stacked full-size units -- typically only 70 to 75 inches high. However, laundry centers also have smaller capacities, so users have to do more loads to wash the same amount of laundry. Full-sized and compact laundry centers can come with either gas or electric dryers, although sometimes only an electric option is available. Unlike washer-dryer combos, laundry centers do need to be vented to the exterior of your home. If you don't have room for a full-sized washing machine and clothes dryer (which we cover in their own reports), and are sick of hauling your clothes to a laundromat or communal laundry room, a washer-dryer combo or laundry center may be a great fit for your lifestyle. While these can take a longer time to wash and dry clothes -- and have much smaller capacities than traditional washers and dryers -- they're still preferred by many who don't have the space or venting capabilities for traditional machines. Still, it's important to understand the drawbacks of these small, all-in-one units so that you have a realistic view of what you're investing in. We saw many complaints about laundry centers and washer-dryer combos that are not defects in that particular unit, but, rather, are common issues with these appliances. First of all, prepare yourself for some sticker shock. From a cost standpoint, laundry centers and washer-dryer combos are not much cheaper than a full-size washer and dryer, and are often more expensive than a budget, full-sized washer and dryer pair would be. While washer-dryer combos and laundry centers can be found on sale at various times, they're rarely discounted by much and you definitely don't see the deep discounts that can be found on full-sized washers and dryers, Laundry centers and washer-dryers combos can also cost more to repair, and the entire unit must be replaced if the washer or dryer stops working and can't be fixed. Once you've decided to take the plunge, though, also keep in mind that washer-dryer combos and laundry centers will never perform as well as separate washers and dryers. They're slower, the washers are not as good at getting clothes clean, especially heavily-soiled clothes, and the dryers -- especially those in washer-dryer combos -- tend to leave laundry wetter and more wrinkled than with traditional machines. One way to combat that is to do smaller loads and to be diligent about taking your laundry out and folding it or hanging it up as soon as you hear the drying cycle stop. Even with these issues, we found that many people learn to work within the limitations of these units. Most are just thrilled to be able to do laundry on their own timetable and in their own space. There are no expert reviews of washer-dryer combos or laundry centers. They simply are not common enough and popular enough to draw the attention of comparative test sites, even those that otherwise extensively test washers and dryers. Thus, we relied exclusively on owner reviews posted on retail sites. Online appliance retailers like Home Depot, Lowe's and Sears are the best places to evaluate user reviews. Amazon, while not an appliance retailer, per se, had more washer-dryer combos available for this update that we've seen in the past. Some washer-dryer combos get dozens of reviews, others only a handful, and most retailer sites mix in ratings drawn from elsewhere, usually that manufacturer's web site. User reviews posted at manufacturer sites appear to be as unbiased and uncensored as those posted directly at retail sites, so reliability is not an issue. The problem is that the same reviews appear repeatedly at different retailers, so we took that into account when making our picks. Among washer-dryer combos, we saw the best feedback for the LG WM3488HW (Est. $1,600). It's particularly popular with condo and apartment dwellers who don't have an outside vent. They say it works well for a combination unit, and is surprisingly quiet. It takes from 1.5 to 5 hours to cycle through a load, depending upon the settings you choose, something that taxes some reviewers' patience. In spite of its compact size, the 2.3 cubic foot LG WM3488HW is well-featured. 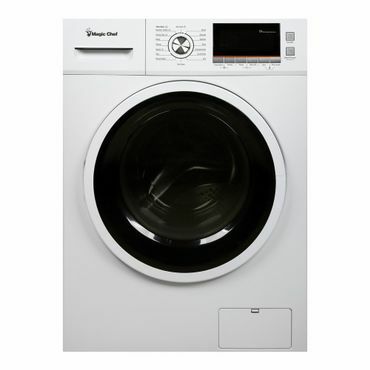 It has nine wash cycles, five spin speeds, five wash and rinse temperature options, and four drying cycles. But the feature owners really love is the sanitize setting, so you can de-germ things like stuffed animals that may not hold up well in a traditional wash cycle. While this is the standard capacity for a washer-dryer combo unit, it's still not very generous. Most users have found ways to work around both the long run times and the small capacity, such as starting load when they leave for work, and/or doing at least one load every day so they don't get behind. While we saw a few complaints about the LG WM3488HW's small size and long drying times, most owners are thrilled to have an alternative to a coin-op laundry. The LG WM3488HW is white, but it also comes in silver as the LG WM3488HS (Est. $1,700). If you have a bit more space, and would like a bit more capacity, LG makes a larger washer-dryer combo, the 4.3 cubic foot LG WM3997HWA (Est. $1,900). However, that additional capacity means it's also as wide as some full size washers at 27 inches. It offers all of the features of the 2.3 cubic foot LG combo above, plus a few extras, including a tilt drum to make loading easier. The LG WM3997HWA's feedback from owners is not quite as strong as its smaller sibling, although it does have many more reviews because it's been around longer. Compliments and complaints match up with the WM3477HW -- most love the convenience compared to shared laundry facilities and say it works well, but they have to hang clothes to help with de-wrinkling. Others say it's simply too slow or they want a unit that will fully dry their clothes like a traditional dryer does. One tip we spotted: owners note that with any of these washer-dryer combos it's helpful if you don't overfill it. A number noted that they keep two separate, small laundry baskets on hand to control the size of their loads, and they just alternate washing those smaller loads. If the idea of spending $1,500 or more for a washer-dryer combo leaves you feeling like you've just been soaked, we saw some decent reviews for a much less expensive option, the Magic Chef MCSCWD20W (Est. $800). It doesn't have the number of features and wash/dry options of the aforementioned LG machines, but it's also less than half their price. The Magic Chef is small, but, again, those who have limited space have figured out ways to keep up with their laundry in spite of that. The drying function also gets poor reviews, as we see with all washer-dryer combos, but most say that it's sufficient for their needs and they don't mind hanging clothes to prevent wrinkles and finish out the drying process. They also note that it's very quiet and easy to use. The Magic Chef MCSCWD20W will fit into a 24-inch wide space, so is a good choice if you're both on a limited budget and have a tiny residence. The Magic Chef MCSCWD20W comes in white, but is also available in black as the Magic Chef MCSCWD20W (Est. $850).